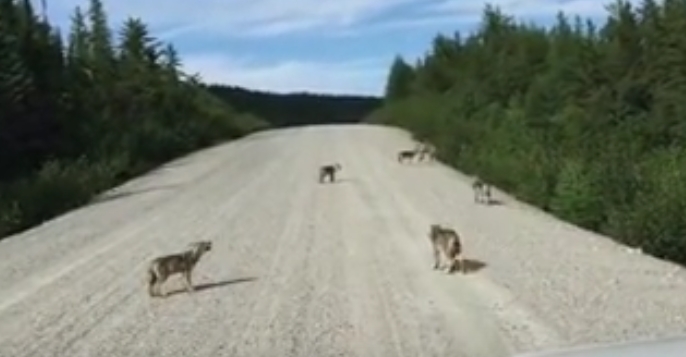 Six wolf pups were caught on film howling in the James Bay region of Northern Quebec. While not all of us can say that we’ve seen a wolf, most of us have heard its howl. And though a wolf’s howl often has ominous connotations, the behaviour is actually a form of social bonding. Because the howl is such a critical social skill, it’s very important for wolf pups to learn the behaviour early. This tiny pack of pups waste no time developing their social skills, treating a driver in the James Bay region of Northern Quebec to a once-in-a-lifetime show—and an adorable one at that. It is fortunate that the driver is safely inside the car, as we can assume the pups mother is nearby. While wolves are not naturally aggressive toward people, they are wary of them, and a mother would naturally be very protective of her little ones. Responses to "Amazing close encounter with 6 wolf pups howling together In North Quebec"
Beautiful. Wonder where Mom is? Wonderful. I heard mum howl once and they all stop to listen...she's not far away. What an amazing moment to witness! I don't think Mum would have injured anyone. Just call her pups and get away from those terrible smelling humans. Lets not make this into the "big bad wolf" No wonder we can't that image away from people.